Let’s face it. Every time you turn around, you find new advice on being happy. Books promising to reveal the true secret of happiness. Blog posts telling you, “Write down three things that make you happy today.” Friends saying, “Move on!” and, “Cheer up!” after you’ve had a bad day. And maybe you’re wondering… what’s wrong with that? Happiness is a good thing right? Well, yes. Of course it is. But we are being taught that our lives should be a straight and narrow path toward happiness. We are taught that we should strive for happiness, and happiness alone in everything we do. And that if we’re not always feeling happy, then something is terribly wrong. 1. We view setbacks and growing pains as failures. When we actively pursue happiness, anything that makes us feel unhappy can seem like a failure – such as a simple setback or challenging moment – when in reality these things are unavoidable, normal parts of personal growth. Sometimes it’s just easier to feel depressed and trapped by these experiences and let them get the best of us. Think about a time in your life when you faced a challenge. Maybe you lost your job, were betrayed by a friend, or got rejected by a loved one. How did you respond to this? Did you feel like a victim, or did you embrace it as an opportunity to grow as a person and learn something valuable? If you’re like most people (including myself), you probably struggled to have a positive attitude at the time, and the situation was probably incredibly hard to deal with. And the truth is, challenges are never easy. However, setbacks and challenging moments in life are also opportunities in disguise for something bigger and better. If we can learn to appreciate and embrace them equally to the moments that make us feel happy, we can more easily see the light in our darkest moments, push through these difficult times and make the most of every opportunity to heal and grow. 2. We get addicted to short-term, quick fixes of pleasure. In our impatience to find happiness, we often seek pleasure instead because it’s easier to achieve in the short-term. This can cause us to rely on pleasurable experiences in an unhealthy way. For example, we might actually find ourselves feeling anxious if we don’t have anything to look forward to, such as an exciting vacation in the near future. But relying on pleasurable experiences as a means to happiness will only leave us always wanting more – much like a drug where we become an addict to our next fix. Because pleasure is short lived and offers no sense of deep fulfillment. 3. We neglect the amazing people around us. Deliberately striving for happiness can also lead us to be self-centered – “I want happiness and I want it now!” – instead of achieving happiness over time through meaningful experiences and service to a greater cause. In this case, where the focus is only on today’s must-have dose of happiness, we become more of a taker rather than a giver. We focus all of our attention on ourselves – me, me, me – so our immediate desires are more easily met, instead of considering new ways to make a rewarding, lasting difference in our lives and the lives around us. We prioritize our pursuit over all the people – family, friends and strangers – who need us. The truth is, making a difference by giving to others is actually one of the greatest ways that we can find happiness. There is no exercise better for the heart than reaching down and lifting people up. It gives us a greater sense of meaning, purpose and fulfillment and often makes us feel much more content with our lives and who we are as individuals. 4. We let our expectations sap the joy out of genuine experiences. Think about a time when you were looking forward to something. Maybe it was as simple as a nice walk on the beach with your partner, or perhaps a vacation you had been planning. When the time finally came, did you find yourself getting completely lost in the experience and having a great time, or were you scatter-brained with expectations of how the experience was “supposed to be,” and thus subconsciously feeling somewhat disappointed? Too often we become so determined to feel happy in a certain way, that we end up focusing too much on whether an experience is meeting our expectations. But studies show that people who do certain activities with a specific set of expectations, or who monitor how much they are enjoying themselves every step of the way, end up actually enjoying themselves less than those who simply let go and focus on immersing themselves in the experience. Rather than striving for happiness through the expectation of how things should be, try to accept whatever experiences come your way. That way, you’ll be able to appreciate and more easily notice all the positive things around you as opposed to feeling disappointed when things don’t measure up to fantasies. 5. We give up amazing opportunities that require temporary discomfort. Think about a time in your life when you went through a tough but rewarding experience. Perhaps you took on a challenging project. Do you remember feeling a great sense of anxiety telling you that you would fail, but you didn’t? And as a result, not only did you achieve something amazing, you also opened up an array of new opportunities for yourself, became a little bit wiser, and gained a greater sense of self-confidence. 6. We look for happiness in the wrong places. A 24/7 obsession with finding happiness can cause us to focus on the wrong things, because we’re often poor judges of what will make us happy. For example, we might think that buying a new house, being popular and having a certain amount of money will make us happy, so we strive relentlessly for them, but in reality, when we finally get these things, we still feel like something is missing. It’s the old “I’ll be happy when I’ve got X” syndrome. Except when you get X, you realize it’s not everything you expected. It never is. Perhaps it’s because we are constantly being sent messages from society and popular media telling us that X, Y & Z will make us happy. We hear, “If you’re slim you’ll be happy,” or, “If you have the latest technology you’ll be happy,” or, “If you’re rich or popular you’ll be happy.” And because we’re so obsessed with finding happiness, we buy into it. The truth is, these things don’t lead to a deep sense of happiness, and we’re often poor judges by believing they will. True happiness comes from within yourself, not from something or someone else. Don’t make the mistake of waiting on something or someone to come along and make you happy. 7. We tie our happiness to the futile idea of perfection. Society shows us doctored images of perfection constantly in marketing and popular media. Do not buy into this illusion; it will only lead you into darkness. Embrace your quirks, your flaws and the fact that life is a roller coaster at times. Strive for excellence, have high standards… but never confuse that with the crippling behavior of perfectionism. It’s about understanding that life is not just a bowl of cherries, and that in order to grow and learn, we rely on the harsh realities of life. Because we know that they will make us stronger, more passionate, motivated, versatile, confident, resilient, capable and ultimately more whole as individuals – as well as adding more meaning and deeper fulfillment to our lives. Embrace rather than avoid life’s adversities. Laugh at your mistakes and learn from them. Joke about your troubles and gather strength from them. Have fun with the challenges you face and then conquer them. Rather than shutting out or suppressing negative emotions, allow yourself to really feel them, so you can deal with them. Take full, unhindered control of your emotions, so your emotions do not control you behind your back. Find peace with yourself and your past. Rather than remaining angry or hurt throughout your life, choose to forgive yourself and others, and try to actually appreciate the experiences for what they have taught you. Proactively identify knowledge gaps in your life experience and take steps to fill them, even if it requires you to stretch your comfort zone. Shift some of your attention away from what you want, and refocus it on what others need. When you choose to actively seek wholeness, your life will feel much more fulfilling. You will feel more satisfied and happy with your life, because rather than feeling burdened by life’s challenges, you will be on a constant journey of growth and discovery. Everything, good or bad, will move you forward. What else would you add to this list? What mistakes have you made in the pursuit of happiness? How have you coped? Leave a comment below and share your thoughts and insights. Author Bio: Chantalle Gerber is a writer and co-founder of Want2discover where she writes about how to live a fulfilling, meaningful and happy life. For some great ways to pursue wholeness in your daily life, grab a copy of her free eBook: 52 Simple Steps Towards Happiness and Success. This post was timely and amazing. An excellent contribution to the community here. And honestly, I have this blog and community to thank for this. Every few days I am sure to read one of the posts here and all the comments (or a few pages of Marc and Angel book when I’m offline). They really give me the extra strength to move forward and fight for my honest existence, and are like bullets of positivity hitting me from deep within. Through them I have been making myself more whole. The most important lesson I have learnt is that happiness is a choice first and foremost. For the longest time I made the mistake of thinking things had to be perfect before I could be happy. While it may be true that many of our circumstances, environment and surroundings can affect how we feel and how we view life, but ultimately, how we choose to feel and react is our own choice. Thank you for your wise words. Great read, as always. Excellent guest contribution. The happiness mistake that holds me back is my perpetual thinking without acting, which is somewhat related to #5 in this post. I know I do this, but still I often catch myself spinning in a cycle of lots of thought and little action. I learned these two tips from the productivity chapter of Marc and Angel’s book, and they have helped me tremendously. I think where my biggest challenge is comes in thinking that I can will happiness into being. That I can out-passion, out-love someone into giving back. And so, I create unrealistic futures for myself. When these castles crumble, it’s devastating. It’s a variation of #4. It’s not that I don;t enjoy the experiences, it’s that I extrapolate them into something that doesn’t exist, and may never exist. @Amandah: It’s such an amazing step to finally realize that happiness really is a choice. Sometimes we become so confused with what happiness actually is and we strive for a ‘perfect’ life…and we wonder why we are not getting any happier. And yes, while our circumstances and environment can affect us, at the end of the day, we can choose how to respond to these things. Like everyone else, I still have to remind myself of this often 🙂 Thanks for sharing! I also found this post timely and serendipitous to my current situation. I have been out of work for the majority of this year, and though at times it has been EXTREMELY challenging and has gotten me down, if it weren’t for this time, I would not have had the chance to look inside, reflect, and reassess what I really wanted. In answer to your question – for a long time this year I was still pursuing an outdated idea of happiness for myself. After doing well at school and then finishing uni, I thought the natural path was a corporate job in the city, and pursued this for years, though unsatisfied. This year I faced up to that outdated, constricted idea, crumpled it in a metaphorical ball and threw it away. I decided to pursue what I actually enjoy. Through the hardship of the year, there have been huge rewards in my personal growth. Without the challenges, I would never have been able to move forward in a new direction. You have outdone yourselves this time. I normally read your stuff from time and time, and sometimes on a 10 point list, only a few things apply to me. With this list, every point applies to me and this is easily one of the most profound things I’ve ever read. I feel that in my soul. Thank you for reminding me of the important things! The biggest mistake of my life and the biggest challenge still is summed up by the quote at the beginning. Too busy looking for happiness to actually feel happy, too many years spent trying to figure out the meaning of life and not enough years spent actually living it to have a clue. Oh, if only I had this when I was younger and was actually willing to listen to this advice (I doubt I would have listened to it when I was younger anyway, I was rather Nihilistic). One thing I might add to this list as well is to find out what your strengths are to help you get out of the “happiness” mindset. We get so caught up in what we need to improve and what we are bad at that we sort of shut down and look for happiness to smooth over what we think we lack. The Strengthsfinder test did wonders for me personally. It gave me the things I was good at and allowed me to acknowledge I actually can do well at something. From that point, it was easier to work on challenging things because I could use a strength to get over the hump. This is a fantastic list though. I really do appreciate it (and the wonderful comments that have been posted so far…some eye opening stuff). Thanks for sharing this with us! As always is a very easy reading and also easy doing items that everyone who wants to be wholeness. It takes practice, practice, practice,a bit(tons) of patience and starts all over again. But at the end you can say you have it. I think the trick is to just flow with the world and your feelings in that very time of your life. You are not always the same so the smart thing is to re-do yourself keeping what works for you and learning more good stuff. A very strong way to learn is helping others, no looking for something rather than the feeling of a fair action. Thanks and regards from the other side of the world! Great read. I developed my own personal motto a decade or so ago during the darkest of times. “I have two choices, sink or swim” I learned that only I have full control over myself and nobody else to blane for my choices so figured I must make the best of all things. And with that in mind I feel I can find happiness in so many more things now. Everything out there is an opportunuty, make it make you happy. What a stunningly perfect, absolutely timely piece of wisdom. Thank you for this. I am all too guilty of snapping up “happy moments” like some shopper at a midnight clearance sale. This reminds me to stop, breathe, and simply allow myself to experience ALL that life has to offer. Thank you. I’ve definitely got caught up in thinking happiness lies in perfection. I would think that if I can be perfect or if everything in my life is exactly as I want it to be then I’ll be happy. The truth is that we have to find happiness where we are rather than where we want to be. If we keep putting it off then happiness will always elude us. Great post! I was very moved and identified with several points made. It allowed me to reflect on my personal life and what is most important. Think only of being happy and you will never appreciate anything. Concentrate on being grateful and you will have happiness as a bonus. Thank you for the heart-warming article. The section, “The secret to a fulfilling life is wholeness, not happiness” and “How to strive for wholeness” targets the EPICENTER of happiness! This article flows with the realities of life…that have a universal appeal. Everyone has a burning and yearning desire for happiness with ourselves – and in our relationships. However, as you accurately explained it can be an elusive, frustrating, and disappointing journey to achieve true, meaningful, and lasting, happiness. Truly, the heart is the epicenter of who we are, and our quest of self-discovery, introspection – and the emotional roller coaster ride begins inside. “Happiness is an INSIDE job”. As explained in this post, what we really want in life is deep fulfillment. I believe this is achieved by satisfying our physical, mental, emotional, psychological, intellectual, moral, social, and spiritual needs (the whole person). Also, we must compassionately reach out to others, and bravely venture outside (or enlarge the size) of our comfort zones. My satisfying journey confirms that a life of service is the most fulfilling life…leading to the path of genuine happiness…for it nourishes the heart…..leading to more personal fulfillment. “Discover the Fun in DysFUNctional”! This is my anthem to happiness and personal fulfillment! I appreciate the courage and openness of the members in our community. We are sharing our stories, feelings, emotions, challenges, and personal journeys. 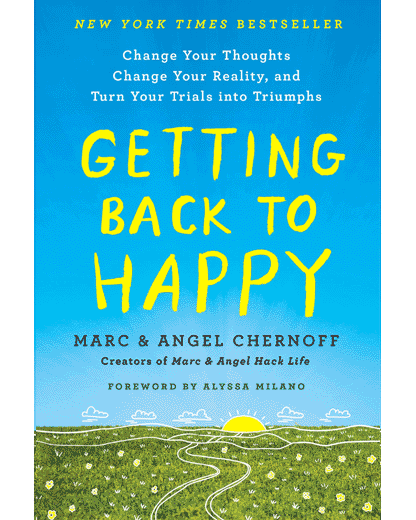 Finally, thank you Angel and Marc for offering this community platform (this happy place) to share our open minds, hearts and personal voices. Websters dictionary says happiness is the emotional or mental state of well-being – it’s contentment and intense joy. We all want to experience these feelings on a daily basis. We can experience this if we simply do the things that we love. What do you love? “If we can learn to (add perspective shift), we can (add progress goal).” The problem is that many of us simply do not have the tools to figure out HOW to learn to (confront hard thing). Many times we know exactly what we would like to happen, but we have NO clue how to ‘learn to…..’. Where’s the manual, where’s the instructions, where’s the mentor, where’s the guidance, how do we know we’re doing it right, this ‘learning to’? I’m in such a situation now; the absolute defining moment of my life…..I know what I want and need to do…….but no idea how to ‘learn to’ do it. I’ve been stuck for several years, watching my life get eaten away, simply because I do not know how to ‘learn to’… I’m still willing… I’m still game… I’m still fighting… but the days are getting long. Wonderful post. Still baby steps, but also still moving forward. @Captain Kirk – you got this. Really. Thank you. “Tucked away in our subconscious is an idyllic vision. We see ourselves on a long trip that spans the continent. We are traveling by train. Out the windows we drink in the passing scene of cars on nearby highways, of children waving at a crossing, of cattle grazing on a distant hillside, of smoke pouring from a power plant, of row upon row of corn and wheat, of flatlands and valleys, of mountains and rolling hillsides, of city skylines and village halls. But uppermost in our minds is the final destination. On a certain day, at a certain hour we will pull into the station. Bands will be playing and flags waving. Once we get there so many wonderful dreams will come true, and the pieces of our lives will fit together like a completed jigsaw puzzle. How restlessly we pace the aisles, damning the minutes for loitering waiting, waiting, waiting for the station. Sooner or later we must realize there is no station, no one place to arrive at once and for all. The true joy of life is the trip. The station is only a dream. It constantly outdistances us. “Relish the moment” is a good motto. It isn’t the burdens of today that drive men mad. It is the regrets over yesterday and the fear of tomorrow. Regret and fear are twin thieves who rob us of today. @Alexandra: It’s so great to hear that your challenging moments have brought you to an amazing place – where you can push away what’s ‘expected’ of you and rather do what you truly enjoy. It’s amazing because like you said, if it wasn’t for those challenging times, you wouldn’t have gotten to this point in your life! @matthew eaton: Thanks for the great point. You’re so right. We often focus on our weaknesses rather than our strengths. I agree that focusing on our strengths instead is so important. We need to acknowledge and give ourselves credit for what we are good at, and realize we are good enough just as we are. “Happiness is an INSIDE job” – I love you way you put this! It’s so true. Happiness is a journey, and to find happiness you need to embrace wholeness – which means experiencing an array of different experiences in life – both good and bad – so that you can grow, learn, and find deeper fulfillment. It just shows that our happiness does not depend on others around us but rather on our choices, attitude and responses to life and all that it has to offer. Like you said – It’s an inside job! @Lost : It’s always frustrating when you are in that challenging moment but it’s when you are in that place that you are pushed to reflect and search for the answers. You just need to stay strong and try to appreciate it all for what it will teach you – being able to appreciate the hard times will give you more strength and hope to overcome it. Excellent thoughts here, I really enjoy reading all of your posts. Great work as usual, I am always looking forward to reading your what is posted on this site. It gives me the strength to move forward and understand that everything happens (good or bad) will makes us stronger in this journey we call life. Thank you so much for your contributions; it is a joy to have people like you who are working to help humanity in so many different ways. One of the best articles ever! Thank you so much!! Happiness can develop from both the inside and the outside. However, when it is dependent on outside forces and sources, it is usually temporary and fleeting. Personal fulfillment is centered on the inside, it resides peacefully in the heart, and has the potential to blossom into JOY, which makes our heart sing, and brings delight to the song of life. Stay grounded and centered, inviting more JOY into your daily life. You hit the nail on the head with these. I think not taking up amazing opportunities because of temporary discomfort is a huge reason that ends up causing people to be less happy in the long run. When you have to live with regrets, you will not be happy that often. @Revena J: This whole concept about striving for wholeness and not just happiness alone has been a huge revelation for me – and has truly changed my life. I can finally feel content with my life – and with the combination of both positive and negative moments. What I love more than anything though is to see other people realizing this too. Because I believe it will break people free from finding happiness in the wrong places. It’s so liberating to be able to appreciate all aspects of life. I’m so glad you have discovered this too! @all: Hi everyone! I just wanted to thank you for the lovely comments. I love the thoughtfulness you have put into your comments. You are all so genuine and have shared some really deep and interesting points. So thank you! I’m also really happy that my article has given you some powerful insights and that you feel inspired by it. Thanks for the article. I totally agree with the idea that happiness is a journey and a choice we make. But still struggle to be happy. I lost that ability after my marriage fell apart. It’s been the hardest experience of my life. He was then only person I truly loved and I gave everything into that relationship. I had a terrible few year between 2009 and 2012 trying to keep the marriage together. I’ve now been separated for two years now and bringing up three children. I agree that you need to embrace adversity and joy equally. I am not sure that I ’embraced’ adversity. But I fought not to let it get the better of me. I went back to university, studied and qualified to become a teacher. I am now teaching. I have experienced ‘moments’ of happiness in last two years. But it still alludes me. I feel like I am on auto-pilot and I don’t know how to feel happy again. I’ve started to question what I am doing wrong. I still struggle with the concept of failure. Failed marriage, bad day at work…it all brings me down. I have liked the idea of being helpful to others and putting a smile on the faces of those in need. Being a blessing to someone else is actually very fulfilling. Thank you please for making our lives better through your enriching posts. I am absolutely in love with this blog. I was looking for ideas to start my own but now don’t know how to start after looking through this amazing source of inspiration <3 Keep up the incredible work. Hi, you’ve got it all right, happiness should come from within us, not around us, embracing adversities in life, learning from it, having a positive perspective, having inner peace and gratitude within our hearts are all very important factors in gaining the true meaning of happiness. Thanks for sharing. Great Post! I love your take on happiness and I do agree that wholeness is the secret to a fulfilling life. Acceptance of yourself and others is important and the determination to move forward past the challenges and difficulties in life is what makes me happy. Mostly I live my life openly and exactly as described in article, but it is not continuous. To add to this great list, taking an approach of Mindfulness when possible really helps reduce focus on all negativity and allows us to take a step back and see life from a different perspective.